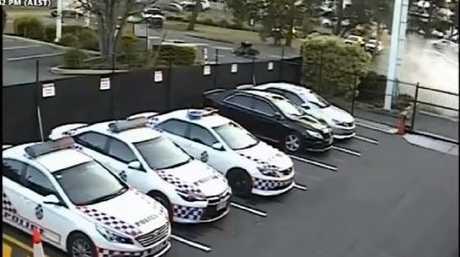 AN alleged bikie has been dealt a swift dose of karma after his attempt to goad police failed spectacularly outside a southeast Queensland police station. Security cameras captured the moment the rider, believed to be wearing Bandidos Outlaw Motorcycle Gang (OMCG) colours, performed a burnout but then fell off his bike outside Springwood Police Station on Friday. Police are seeking public assistance to identify the rider in question. Police are appealing to the public for assistance to identify a motorcyclist who performed a burn-out at the Springwood Police Station on Friday. "Around 5.20pm on Thursday September 13, a male rider dangerously operated his motorcycle in the driveway of the Pacific Highway station," police said in a statement. "While performing the illegal manoeuvre the man fell from his motorcycle, before climbing back on and riding away. "The man was last seen travelling south on the Pacific Highway Service Road. "Police are appealing to anyone who was in the area around the time or the event and witnesses something - or has dashcam footage - to come forward."